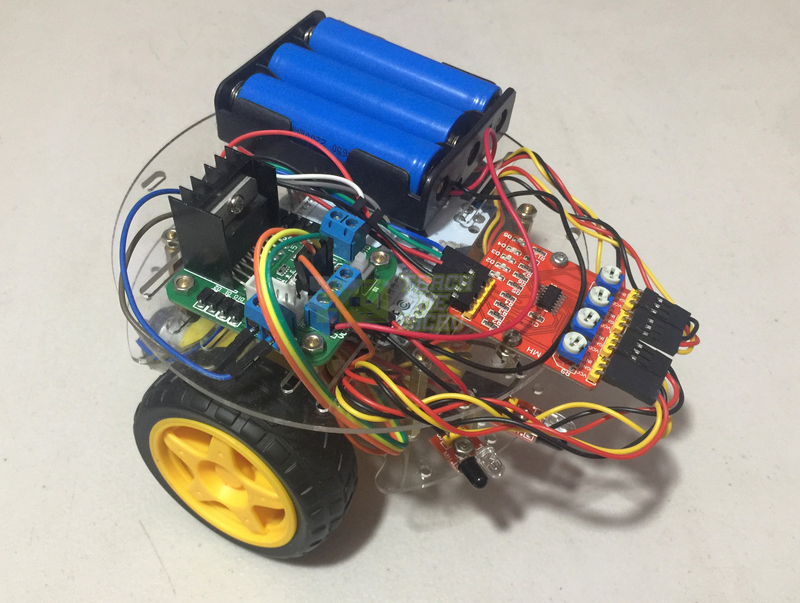 Obstacle-Avoiding Arduino Robot | Teach Me Microcontrollers! An obstacle-avoiding robot is a simple wheeled machine that avoids any obstacle in front of it. The obstacle can be detected using ultrasonic or infrared signals; these signals can be reflected back to their source by solid objects. For this project, I will be using an infrared sensor to detect the obstacle. 2.6 Step 6: Let the Robot Run! I chose to buy my own robot body primarily to reduce building time and also because it's very cheap. The circular robot body comes with two geared DC motors with wheels and an AA battery holder. There are also holes on the chassis for mounting the Arduino board and other needed modules. I decided to use three 18650 Li-Po batteries as power source which gives around 11 volts. The L298N module isn't like the one I featured in my tutorial but it's basically the same except for a power button which makes it better (because I don't have to include a switch on this robot). Of course, any robot body can be used with this project, as long as we have the same type of obstacle sensor (IR), motor driver (L298N) and microcontroller (Arduino). As mentioned, the robot chassis already has holes in it which made the assembly rather easy. However, it seems the chassis was not meant to be used with the materials I listed above so I had to improvise. The robot chassis has two main parts: the bottom and the top part. The bottom part is where the main wheels and swivel caster wheels are attached. It is also the part where I attached the four IR sensors for obstacle detection. As you can see, I've soldered wires to the motor. These are male-male jumper wires with the other end cut off for easy soldering. The chassis comes with two caster wheels and has holes for both but I found out that the front caster wheel tends to lift up the base, hence, not allowing the bigger wheels to touch the ground properly. So I had to remove it (can be seen in the video below). The Arduino sketch for the robot is not that complicated. The idea is that the robot should go away from the obstacle detected by the IR sensors. For example, when the left most sensor is triggered, the robot must backpedal, turn right and then go forward. The IR sensor is basically an IR LED and receiver pair. When something is in front of it, the radiation from the IR LED bounces back to the receiver. If nothing is in front, the receiver will receive nothing. This concept is a simple "on and off" scheme. So to detect an obstacle, I only had to read the pin where an IR sensor is connected. If it's high, there's something there. Otherwise, there's nothing in front of the sensor. To move forward, I need to rotate the wheels in the same direction. I wanted the robot to not move too fast. In order to control its speed, I used PWM to drive the motors through the L298N driver module. Producing PWM is just using analogWrite() but of course, I had to make sure that the Arduino pins for motor control are PWM pins. Step 6: Let the Robot Run! Got any questions, tips or reactions? Kindly comment below or create a thread on our community page!